Happy Sunday, friends! Are you relaxing hard on this day of rest? We have just finished up a packed-out week in Florida, and as much as I love being on the go, it feels good to be home. We visited with my family in Orlando, spent a magical 24-hours at Disney, and managed to squeeze in a viewing of Hamilton in an off-Broadway production. Truly, it was a mini version of all of my dreams come true, and I loved every minute of it. 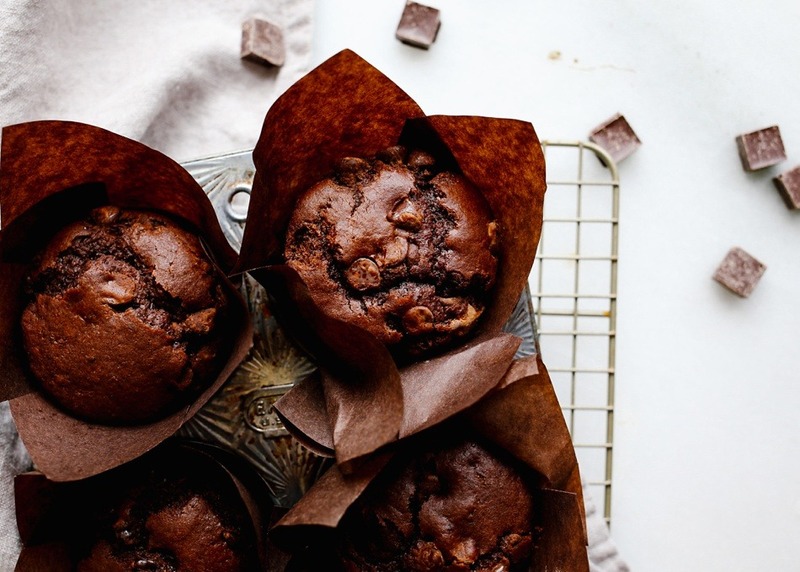 Now that we’re back home it’s time to get back to work, and today that includes these double chocolate muffins. So why muffins for the second installment of #monthofchocolate? Three words: BREAKFAST IN BED. You need some good options. I’m going to list out a few other favorites at the end of this post, but I think it’s vital you have a make-ahead chocolatey treat to serve your honey (read: self) on Valentine’s Day morning. 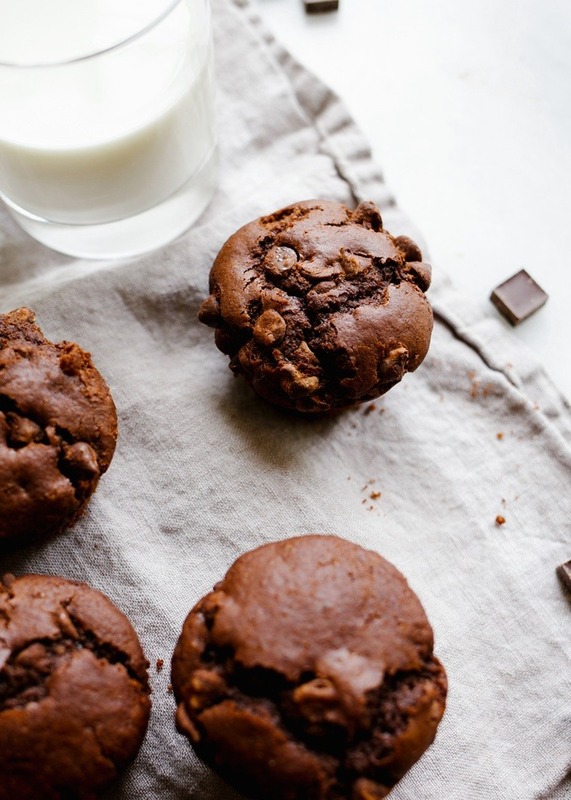 These double chocolate muffins could not be easier. The batter is a one-bowl situation that bakes up in less than 20 minutes and requires absolutely zero melted chocolate. It will easily take your favorite chopped chocolate or chipped morsels and you can even use all butter or all oil if you want to simplify even more. It’s adaptable, easy-peasy, and just the type of thing you can casually save in your freezer for a rainy day. Truly, you need these. To make double chocolate muffins, we start by stirring together the liquid ingredients. Oil, an egg, milk, and vanilla are combined before the sugar is stirred in. The second (and final!) step of this ridiculous-easy process is to fold in the dry ingredients. Flour, cocoa powder, salt, and leavening are barely added in and then chocolate chips get tossed in as well. After that, the double chocolate muffins are ready for the oven! 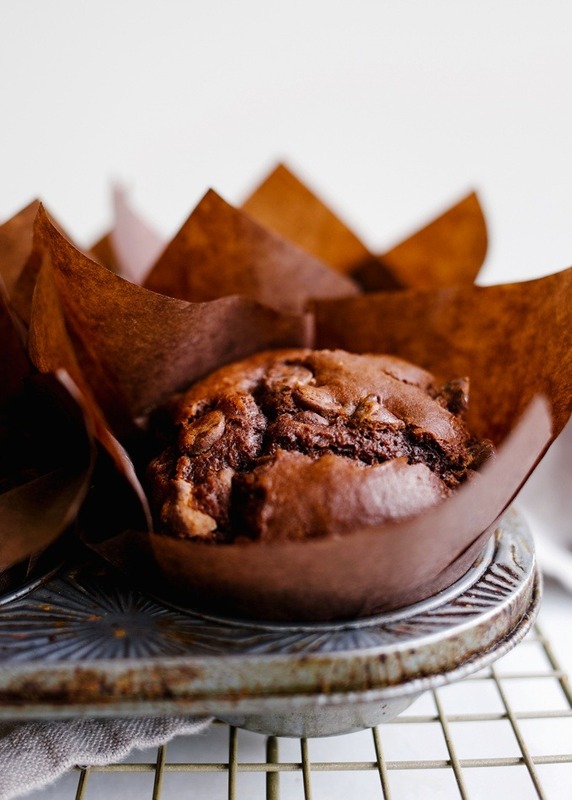 These double chocolate muffins bake up moist and cakey, and their appearance will change depending on whether you’ve opted for chocolate chips, chunks, or freshly chopped chocolate. I tried adding little chocolate covered cacao nibs in one batch and was really okay with the coffee/chocolate combo. After my husband tried a couple of bites of these muffins, he asked me what the difference between muffins and cake was, and I think it’s because they really just kinda taste like dessert. I’m totally here for it. 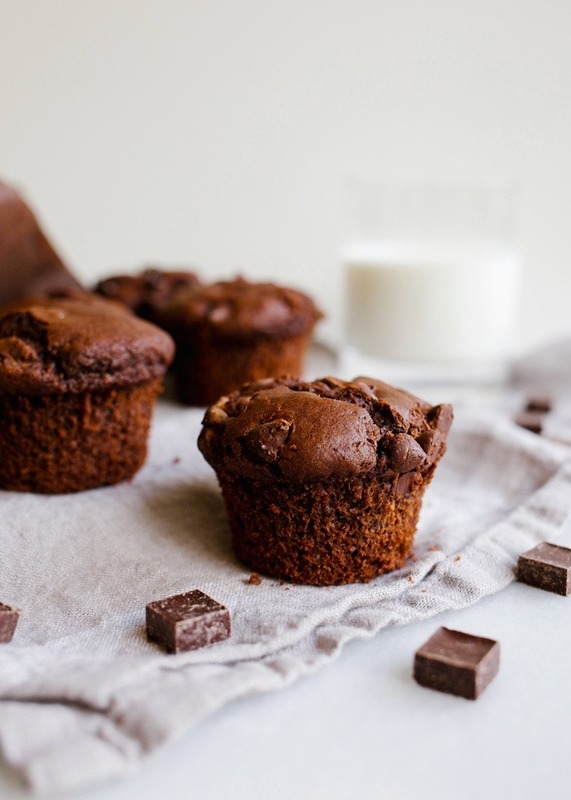 I hope you’ll give these double chocolate muffins a try, but if you find yourself needing a few other breakfast options, check out some of my favorites below! Breakfast is an overlooked and underrated meal, and I can think of no better time to fancy it up than on Valentine’s Day. Give them a try this week and let me know what you think! Happy baking! 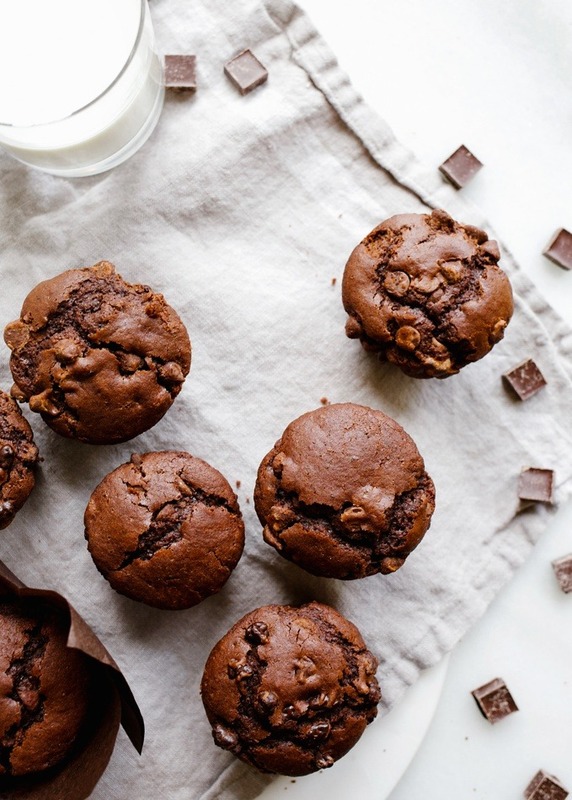 These double chocolate muffins are rich, moist, and come together in a flash! Make a dozen today! Preheat the oven to 400 degrees and line a 12 compartment muffin tin with papers. In a large bowl, stir together the milk, egg, butter, oil, vinegar, vanilla, and espresso powder. Add the sugar and brown sugar and stir to combine. Add one cup of flour, the cocoa powder, baking powder, and salt and stir just barely to combine. Toss the chocolate with the additional 2 tablespoons of flour and fold them into the batter. Divide the batter among the muffin tins (I use a heaping large cookie scoop) and bake in the oven until the tops are set and a toothpick inserted just barely comes out clean (see notes), about 17 minutes. Allow to cool briefly before consuming! In lieu of the milk and apple cider vinegar you can use ½ cup plus two tablespoons of buttermilk. If you’d prefer, you can use all oil in this recipe instead of butter. This yields a very moist and still delicious muffin. Do not overbake these muffins! Toothpicks will often come out chocolate-coated, but keep in mind that the chocolate chips will stay gooey and melted inside. Use your best judgement. I tried them with coconut oil instead of butter and 45 grams whole wheat flour. Husband and his father had 3 each before they even cooled off, while dieting mother in law stopped herself at 2. I made these yesterday morning and they are so easy and delicious!! I used buttermilk because I had some that needed to be used up. My boys and I barely let them cool enough to touch before digging in. I am really enjoying your blog and the recipes you share! On a side note, I am also from Alabama and am pleased to follow a blog by another Alabama girl! oh, hooray! I’m so glad you enjoyed. aren’t they crazy simple?!? I made these muffins for Valentines Day. They are very chocolatey and delicious! Definitely will make these again. What a perfect Valentine’s Day treat! I was out of eggs so I used some meringue powder instead. They are so yummy! Thanks for another great recipe! It worked!? Awesome! I’m thrilled to hear that is a suitable substitute.